Can Africa's Borders Really Become Bridges? Some parts of Malawi is said to belong to Zambia. Cape Town — Since 2004, when the AU Commission directed all countries with outstanding border disputes to clearly mark their boundaries by the end of 2010, Zambia and Malawi have been working on solving problems caused by blurry border limits. The separation of countries through borders was introduced during the colonial times and, as a result, sparked conflict and disputes after the countries gained their independence. Although international organisations like the United Nations and the African Union have tried to help countries solve these issues their efforts have been met with numerous challenges. 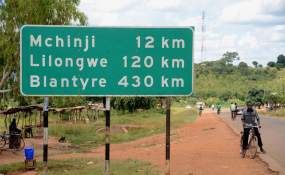 The UA had instructed Zambia and Malawi to solve their border issues and finance the border posts themselves by 2010 but due to lack of funding and technical expertise, the deadline had to be pushed to the end of 2017. Malawi started with the physical demarcation of borderlines on a pilot basis in 1993 and boundary inspections have been carried out since then. In the recent re-demarcation exercise done between Malawi and Zambia, some parts of Malawi including Mchinji, Mzimba, Kasungu, and Rumphi districts were declared as belonging to Zambia. "I propose that the affected people maintain their nationality and be allowed to register upon verification by local leaders," Malawi Minister of Lands, Housing and Urban Development Jean Kalilani said. She also stressed that until a new border treaty comes into effect, local people should remain where they were before the demarcation. The dispute between the two countries has affected learning in some parts of the country. People living near the Malawi-Zambia Border in Mzimba have reportedly been living in fear after some chiefs alleged that Zambians destroyed a Primary School which was initially in Malawi but is now falling under Zambia after the re-demarcation. Zambia is not the only country Malawi is having border disputes with, Tanzania and Malawi began their dispute in 1967 over Lake Malawi. Malawi maintains that all waters between the two countries are in their territory while the Tanzanian maps show that the border runs down the middle of the lake. With a number of never-ending border disputes in the continent, the AU implemented the African Union Border Programme (AUBP) in 2007 in an effort to solve these issues. The AUBP aims to ensure that countries in a dispute over border issues know the extent of their countries and come up with their developmental programmes in the right places such as houses, farms, schools, and roads. However, some of the disputes arising out of fights over natural resources or personal differences between leaders of neighbouring countries. Some unresolved territorial disputes across the continent have taken decades to resolve and the people affected usually have little to no role to play in resolving them, all they can do is hope that the governments fix the problem while they grapple with identity.